Tweets about the return of Laurent Pelly's charming production. 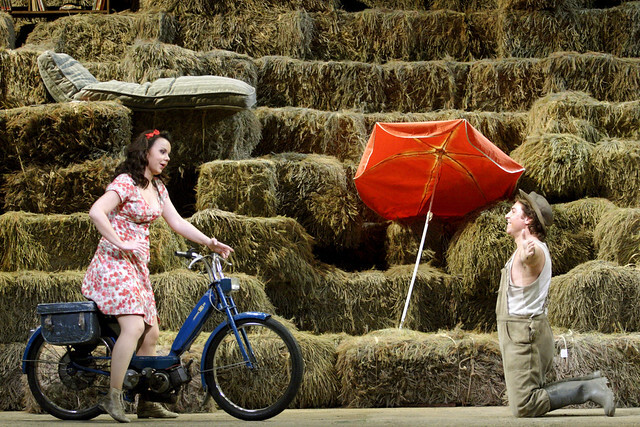 What did you think of L'elisir d'amore? Lovely photos. Very much looking forward to being there next Tuesday! But dismayed to see in top photo the filthy old mattress that incongruously figured in third act of Siegfried has another outing in L'Elisir. Perfect production. Never realised Roberto was such a talented actor as well as tenor!. So pleased I can say that I was there on the opening night, well worth travelling 2000 miles in two days to see. Another 2012 success ROH! That's some journey! Delighted that you enjoyed the performance. The production now is well settled, more delights than before. Alagna was a great revelation although the voice has become heavier (not surprising after Radames and Don Jose) he was an excellent Nemorino in good voice and brilliantly acted .Kurzak is a delight, and Maestri is wonderful.I was a bit disappointed with Capitanucci's undersung Belcore. All in all a great evening at the Opera! Absolutely sensational! Wonderful music, great production, superbly acted. Orchestra was in tip top form and all the principals were in great voice. Roberto Alagna fabulous, as expected, but Aleksandra Kurzak stole the show. Gorgeous voice, technically magical and with bags of personality. Haven't enjoyed myself so much in years. My first time at ROH - it certainly won't be my last. Wonderfully enjoyable evening. Sitting in right stalls could just make out Mr Alagna when he was performing Una Furtiva Lagrima, but I'm sure that those to my right couldn't see him at all. He only needs to shuffle around a little! I was there on Tuesday, It was wonderfull one opera that send me home happy. Roberto Alagna is a fantastic actor and his voice has a beautiful light in it is great to see him doing so well. I am an opera buff living very far from home in Thailand . I am very moved and excited reading about these two productions . The presentation of L'elisir d'Amore in a truly agricultural setting is very refreshing . The production of Rigoletto seems to draw much more from the original story than productions I have seen and enjoyed . I am glad to see some beautiful theatrical realism in the settings . Opera is the whole staging , not just singing in an abstract setting or black drapes , it is a whole visual , oral and emotional experience .